Often time’s people misinterpret the differences between martial arts styles. Generally all martial arts styles are simply called karate especially by those who are not martial artists. Karate is actually a Japanese martial arts style that is based on power and strong basics. 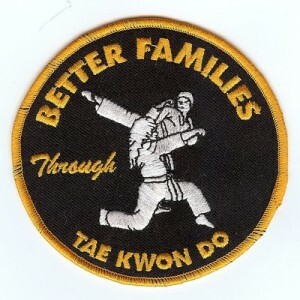 Better Families’ martial arts style is Tae Kwon Do, a style based from Korea. The Miami Tae Kwon Do School specializes in kicks along with strong basics. The popular Kung Fu style from China is more based on flow and more oriented with hands than feet. There are exceptions but for the most part Chinese martial arts specialize in hands, Korean styles specialize feet, and Japanese martial arts thrive with weapons. Karate has been the general term for martial arts for years due to martial arts movies in the 1960s and 1970s. Both Tae Known Do and Karate have very strong and solid fundamentals. Kung Fu has fundamentals as well but the style itself is more fluid in terms of movement. Many martial arts schools including Better Families utilize the popularity of the term karate to draw in the general public. The Miami Tae Kwon Do School has gone as far as having a “KARATE” sign on the top of the building in order to bring attention. The window of the school clearly explains that the martial arts are Tae Kwon Do. Today more attention is brought to the particular styles due to the rise of mixed martial arts and how it uses a variety of martial arts. The three styles: Tae Known Do, Karate, and Kung Fu come from different nations across Asia. Even though all three are martial arts styles in Asia, the principles of each are drastically different. Most people more commonly know the word karate as a term for martial arts than an actual style. Better Families is a Miami Tae Kwon Do that has more differences than similarities with Karate and Kung Fu. Better Families is one of the premiere Miami Tae Kwon Do schools that has been in business for over twenty years. The school has an introductory class to help give the student an idea what Better Families is all about. The instructor will explain how martial arts is just about as important as self-discipline and respect. The level of exercise involved will be discussed in the introductory class as well. Once this initial class is done as an overview to the curriculum, classes will begin at the white belt level. The beginning classes will be pertaining to acquiring the strength and flexibility required to perform safely while learning the basics. The program has a steep learning curve therefore the techniques at first are simple and easy to learn. The basics acquired in these opening classes are essential as they set a foundation for the rest of the Miami Tae Kwon Do curriculum. Better Families ensures their students have a firm grasp of the core fundamentals before going to the next level. Better Families provide their students with the introductory program and then first set of classes at the start. Getting started toward exercising is a difficult obstacle to overcome. The Miami Tae Kwon Do program helps their student get started with the preliminary courses, guidance, and positive motivation. Better Families ensures that their students use their Tae Kwon Do for the right reasons. Martial arts in general should only be used as self-defense, not for harming others. The exercise that comes from Miami Tae Kwon Do is beneficial to one’s health. The discipline developed from learning Tae Kwon Do has a student maintain focus. Better Families cannot stress enough that the martial arts a student acquires should never be used on another person, especially if not in self-defense. The first line of defense is for a student to respectfully talk their way out of the situation, than using their martial arts as last resort. The ability to able to protect one’s self gives the student a high level of confidence. The confidence to talk themselves out of unpleasant situations goes a long way in keeping one out of trouble. The exercising assists in a student’s developing better strength, cardio, and flexibility. Flexibility comes from the kicking that is a main component in Miami Tae Kwon Do, with plenty of stretching. The cardio comes from the light exercising to warm up for class along with the curriculum itself. Strength is developed through push-ups, sit ups, striking, and remaining in a stance for a period of time for leg strengthening. Students from Better Families typically stay in good shape, maintaining is not easy for a lot of people. Overall health is enhanced due to students acquiring, as well as maintaining, good cardio, strength, and flexibility. Miami Tae Kwon Do demands a lot of discipline from a students in order to progress as a martial artists. The overall discipline a students acquires in martial arts is shown in the household, work place, and classroom. Self-discipline is most pivotal in Better Families, as they want the students the make the right decisions on their own. The ability to be productive without having to be told to be is a quality that is valued everywhere. Better Families Through Tae Known Do largely benefits children for a number of reasons. The Miami Tae Known Do school is an after school activity that is all year round. Children like to see progression in their work so the ranking system and sub-ranking system helps their motivation to achieve success. Better Families also has a great reward system as well as consistent positive feedback. The individuality that Better Families offers to students lets them create their own success. The students go through a belt ranking that ranges from white belt all the way to black belt even though the rankings are done individually, the teacher and students work together as a team. 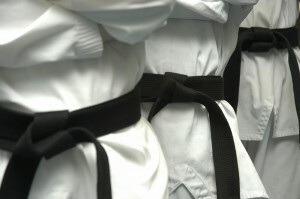 The Miami Tae Known Do sub-ranking system in which a student receives a stripe (colored tape) to put on the belt when proving to learn a set of techniques. One cannot receive a stripe until passing the test to prove they know the technique. The next belt ranking happens once a student achieves earning all the stripes necessary to graduate. The Miami Tae Known Do School has a great reward system in a variety of ways to keep the students motivated. Through every belt ranking there is a graduation in which Better Families holds a ceremony for family and friends to join. This ceremony gives the student the opportunity to show their friends and family what they have learned. Bette Families takes pride in giving positive feedback to all of their students to help his or her confidence. Positive feedback is essential for children, especially those who are doing Miami Tae Known Do as their first sport. The school helps student build the confidence to succeed socially, sports, and in the classroom. Student largely benefit through motivation, confidence, and individuality. Better Families Through Tae Kwon Do offers a great way for customers to exercise and lose weight. This Miami Tae Kwon Do School helps customers with weight loss by working out on a consistent basis while learning the curriculum. The school also offers exercising programs outside of the main curriculum that benefit overall health. Better Families will at times offer dance class, cardio kickboxing, as well as beach training. The Miami Tae Kwon Do school also has their students begin the classes with light work outs and stretching before starting each class. The exercising with Miami Tae Kwon Do involves cardio, flexibility, strength and balance. Flexibility is a necessity that is developed as a student at Better Families Through Tae Kwon Do due to kicking being such a main component. Good flexibility gives a person more balance, leg strength, and agility. Another benefit of having good flexibility is that it helps avoid injuries. Avoiding injuries goes a long way, at many times injuries can very discouraging, especially ones beginning to exercise. Better Families Through Tae Kwon Do requires good balance and leg strength. The balance and leg strength acquired in Miami Tae Kwon Do is not only beneficial as a student but other exercises and sports as well. Balance and strength help with exercises due to the speed and quickness being increased. Performing the curriculum of Miami Tae Kwon Do develops good cardio. The cardio happens on it’s own as the students are focused on becoming a better Tae Kwon Do student. This helps one to get in shape while not focusing on getting in shape, but focusing on becoming a better student. The best part of exercising at Better Families Through Tae Known Do is that a good habit is created for working out. The main problem with people that want to exercise and lose weight is getting started. This Miami Tae Known Do school will help set a foundation for one to start exercising and losing weight in the process. Better Families Through Tae Kwon Do is a martial arts school in Miami Florida that has been in business for over twenty years. Better Families teaches the martial arts style of Tae Kwon Do that originates from South Korea. This martial arts school does not focus on the kicking and punching as much as the other karate schools do. This martial arts school focuses on respect and self-discipline along with Miami Tae Kwon Do. Better Families has more to offer as they strive to better the lives of their students and families. They do this by improving behaviors and communication in the household through respect and self-discipline. Better Families is largely based on feedback from the teachers and parents of the students. Positive feedback of behavior from teachers and parents are necessary for a student to progress in the rankings. Respect towards peers, teachers, parents, and elders are one of the main principles of Better Families. The other main principle is self-discipline, to have self-motivation by taking the initiative to better one’s life. The entire staff helps bring in a family like environment that makes all students feel welcomed. Every instructor goes out of their way to make sure that every student is learning as well as enjoying him or herself. The staff stays on their toes by constantly looking for new ways to improve their teaching styles through feedback from students as well as seminars in and out of the Miami area. The staff, like the school is always looking to grow and improve. The style of Tae Kwon Do requires discipline physically as well as mentally for students to strive in martial arts as well as other activities. Better Families takes pride in having student perform well in the classroom as well as other sports. Even if students decide to participate in other sports they will find that Tae Kwon Do sets a good foundation for an athlete physically. The focus and learning ability needed to learn martial arts helps a student learn in the classroom. The goal is have students not only be a great martial artist but also great in the classroom, in sports and most importantly at home. Better Families Through Tae Kwon Do has been teaching martial arts in South Miami for over twenty years. A key to their success is teaching it in a way that is responsible and associating their teachings with values like discipline and fitness. There are many martial arts schools out there that don’t necessarily emphasize responsibility as much as they should – teaching, learning and using martial arts is an incredible power and responsibility. When teaching children and adults Tae Kwon Do in Miami, it’s not only important to teach how to kick, block, and punch but also how to use it for good reasons like self-defense and as sporting exercise. Using Tae Kwon Do as a way to exercise through training is extremely effective. Going to classes regularly at Better Families can help you lose weight and become a healthier person through exercise. Another way this is helpful, is by giving you a platform to train yourself in terms of discipline. Discipline which can be practiced through Tae Kwon Do can help you achieve success both personally and professionally. When it comes to self-defense, Better Families Through Tae Kwon Do teaches their students how to avoid violent and dangerous situations. Ultimately, the best way to defend yourself is by staying out of dangerous situations. The chances you will have to defend yourself if you stay out of dangerous situations are very slim, but still possible. If you find yourself in a situation where physical violence is unavoidable – Better Families Through Tae Kwon Do’s training will help you defend yourself. Better Families has an incredibly positive philosophy on how martial arts can help you; if you’re interested in using Tae Kwon Do to increase you or your child’s fitness and discipline – give us a call at 305-663-1882 . Three Reasons Better Families Through Tae Kwon Do’s Summer Camp is Awesome!!!! This article isn’t necessarily for those who have been to the Better Families Through Tae Kwon Do Summer Camp, because they already know how awesome it is! There are literally dozens of reasons the summer camp (often referred to as Karate Camp) is amazing, but for the sake of brevity we’ll limit it to the top three reasons. The camp is currently going on and allows students and non-students to enjoy fun and enlightening activities. If you are interested in sending your child to camp, give Better Families a call – they still have room for more campers in their South Miami Tae Kwon Do studio. Discipline – Along with having a great time, campers learn a special kind of discipline that helps them focus their mind, strengthen their body and control their emotions. The mixture of martial arts discipline and ancient eastern philosophies has made Better Families Through Tae Kwon Do’s teaching on discipline famous in the local community. Fitness – Health and fitness are incredibly important for growing children. The exercise and eating habits formed by those at a young age carry over into their adulthood. Better Families Through Tae Kwon Do’s Summer Camp helps children form good habits that they can take with them for a healthier life. Fun – Better Families wouldn’t be such a popular camp without “fun” – and they know how to do it better than anyone. With daily activities in their incredible studio and regular field trips, this is one of the more entertaining camps you can send your child to. They will come home more disciplined and healthier all while have a great time. Tae Kwon Do is more than just a form of self-defense; it is a traditions passed on from generation-to-generation that promotes health and well-being for the individual. Tae Kwon Do focuses not only on physical form, but mental discipline and the ancient Eastern art of meditation. This philosophy of not just promoting physical health, but mental and physical oneness is being accepted more and more as common health practice. Listed below are three ways Tae Kwon Do benefits health and well-being. This is the most obvious way that Tae Kwon Do promotes healthy living. Exercise is vitally important for your metabolism and overall physical health. Most people do not even come close to the recommended amount of daily (weekly) exercise. Tae Kwon Do allows individuals to exercise in a way that is fun, educational and enlightening. A cornerstone of Tae Kwon Do is discipline. Discipline is not something that comes naturally to people but must be learned and practiced. Ultimately, discipline (which is practiced and learned in every Tae Kwon Do class) can positively impact all aspects of your life from personal to business. Being focused, responsible and proactive can all be attributed to an increased sense of discipline. This ancient Eastern art is known to reduce stress levels, increase mental clarity and promote positive physical health. Mediation, like all other practices, is something you can continue to improve over time making it easier to find outlets of clarity in your life. Meditation is a crucial part of learning Tae Kwon Do, as the body and mind must be one to correctly practice this ancient martial art. These health and well-being virtues are practiced daily at Better Families Through Tae Kwon Do . Tae Kwon Do is the national sport of South Korea. Tae means to strike or break with foot, kwon means to strike or break with fist and do means way, method or path. Tae Kwon Do is a combination of self-defense, sport, combat techniques and exercise. The sport of Gyeorugi, a form of sparring, has been an Olympic sport since the year 2000. When training in the art of Tae Kwon Do, the student generally works within a system of blocks, kicks, punches, open-handed strikes, take-downs, sweeps, throws and joint locks. 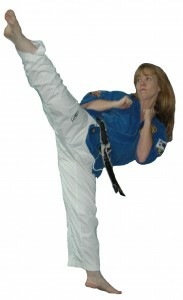 Many Tae Kwon Do instructors utilize jiapsul or pressure points, grabbing self-defense techniques that are borrowed from hapkido and judo. Although each Tae Kwon Do school is different, each student of Tae Kwon Do will most likely take part in learning the techniques and curriculum of Tae Kwon Do, aerobic and anaerobic exercise, self-defense, patterns “forms”, sparring, relaxation or meditation, throwing or falling techniques, discipline, etiquette, justice, self-confidence and breaking of boards. Tae Kwon Do derives from several different kwans and therefore the philosophy can be expressed in a couple ways. However, the International Taekwon-Do Federation’s student oath states “I shall be a champion of freedom and justice” and “I shall build a more peaceful world”. At Better Families Through Tae Kwon Do, we follow the Jhoon Rhee system. We are proud to be one of the most prestigious Miami Karate Schools. Our instructors have inspired over 600 families and we are most proud of our stellar reputation within the community.